An orphaned baby deer in Australia is proving that friendship isn't limited by something like being completely different species. 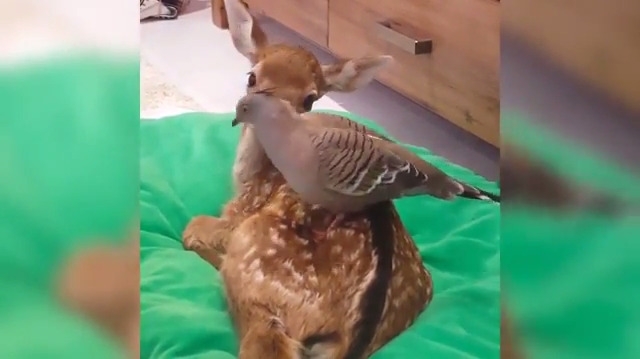 This deer and pigeon have become inseparable, providing a heartwarming chapter in this real-life Bambi's story. An orphaned deer being raised by rescuers in Australia found companionship with an unlikely friend -- a pigeon. The fawn, dubbed Faline after Bambi's mate in the classic Disney film, was taken into the care of a wildlife rescuer named Jess after her mother was killed by hunters in Sydney's Berkshire Park. The deer, rescued in December, quickly formed a close friendship with a crested pigeon that took to grooming Faline and riding on her back. Established since 1984 Berkshire Park Bird Farm is Australia’s largest Bird Farm, set on acres in Berkshire Park, west of Sydney. Berkshire Park, New South Wales Australia, is located on the uppermost northeast boundary of the City of Penrith. Its eastern boundary is Ropes Creek and the suburbs of Llandilo and Londonderry are its southern and western neighbours. Berkshire Park is a sparsely populated rural suburb with limited community facilities. Its small population and rural lifestyle are an obvious attraction and characteristic. Responses to "Orphaned deer fawn becomes best friends with a bird, just like Bambi"